eBay announced changes for its mobile platform this morning, moving to make the selling process more simplified for those not on a desktop computer. With the changes, users will now search for the item they are selling, select it, which will then auto-fill your own listing. At that point, you can customize the listing how you see fit, with pictures, detailed description, and any other info you need. This will be helpful if you’re selling mass produced goods, such as video games, sneakers, or something similar. For one of a kind items, the old fashioned way of selling is still your best route. Furthermore, the entire listing flow is placed on a single page in an easy-to-read format. According to eBay, this should allow for listing your items more quickly and efficiently. Enhanced cataloguing capabilities: search for the item you’re selling using eBay’s expansive catalogue of listings, and the listing flow will auto-fill product specifications, including title, stock image, pricing and shipping options, to help your items successfully sell on the marketplace. You can still make adjustments as needed – including adding a description of the item and more photos – before listing the item for sale. 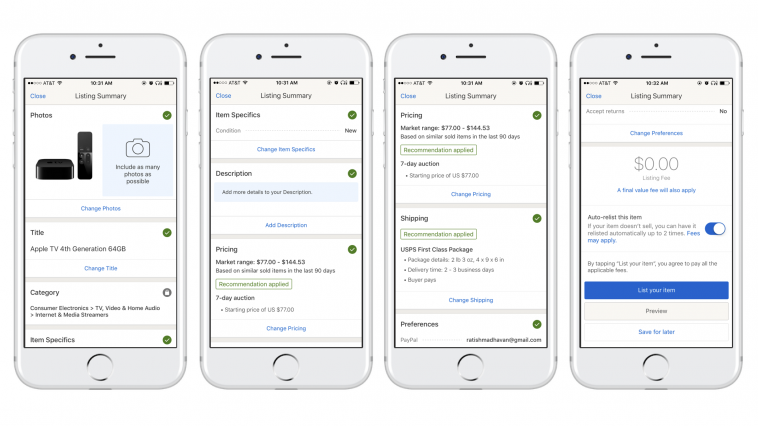 More efficient listing flow: the new layout features all the details of your listing in an easy-to-read format on one page to make selling even simpler and faster. This update is rolling out to Android devices first this week, followed by iOS a bit later.